The Linhay (one of nine converted Grade II listed barns here at Newhouse Farm Cottages) offers guests unrivalled privacy and seclusion. This stunning south-facing detached barn is situated in its own 5-acre field with views towards the parish church. Its location across the lane from the main complex of cottages offers guests unrivalled privacy and seclusion. The Linhay has been converted to a very high standard with exposed roof trusses in all rooms, oak flooring throughout and large windows to capture the light from its south-facing position. 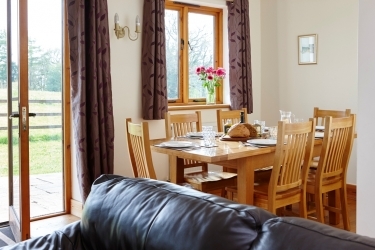 The spacious accommodation will comfortably sleep 6 people in one king and two twin bedrooms. 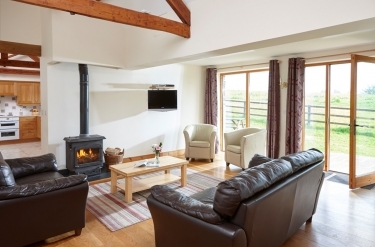 It has a large lounge/dining room with wood burning stove, Sky TV (movies and sports) and DVD player. 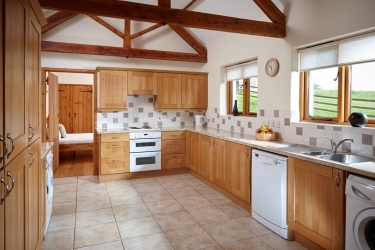 The Linhay has central heating, a fully equipped kitchen with dishwasher, washing machine and tumble dryer. It has free WiFi, telephone (with honesty box) and has a CD player with integral iPod docking station. The three wet rooms (two of which are en-suite) all have power showers (but please note there are no baths in The Linhay). The Linhay has been designed for full accessibility making it an ideal choice for wheelchair users. 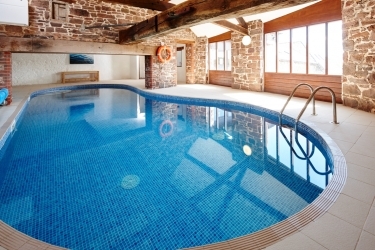 Other facilities at Newhouse Farm Cottages include heated indoor swimming pool with counter-current jets; traditional sauna; free WiFi; indoor games room with table tennis, table football and pool table; toddler soft play room; fun indoor badminton; outdoor climbing frame with swings and slides; trampoline; football goal; small lake stocked with carp; The Hayloft function room suitable for large groups of guests to eat, meet and party in. Please see our own web site at www.newhousecottages.com for further details. Thank you. For further information please see our web site at www.newhousecottages.com thank you.